For farmers and service providers who value high levels of productivity and accuracy with reduced crop and soil impact, John Deere now offers a lightweight, 1,200-gal. (4542 L) capacity sprayer. The new R4044 Sprayer joins the company’s 4-Series Sprayer family, filling the niche for a lighter weight, high-tech, high-capacity machine that gets into the field sooner and keeps working longer. The R4044 Sprayer is 9 percent lighter than the R4045 Sprayer, with a more balanced power-to-weight ratio, thanks to 325 engine hp from a 9.0L PowerTech™ engine. This allows operators to maintain speed under load as terrain changes and results in more accurate applications and greater productivity. 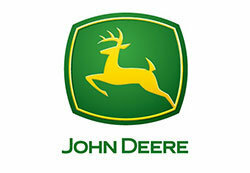 Plus, it features the latest integrated technology, including ExactApply™, AutoTrac™ Vision, and 4600 CommandCenter™ display, found on other John Deere 4 Series Sprayers. In addition to the 1,200-gal. (4542 L) solution tank, the R4044 Sprayer features VF tires for superior traction and reduced soil impact, and steel booms up to 120 feet in width. Customers have the option of carbon fiber booms in 120-ft. (36.57 m) and 132-ft. (40.23 m) widths for additional machine weight reduction and increased productivity. A 200-cubic-foot (5.66 cbm) drybox option is also available for dry fertilizer applications. This new sprayer also incorporates the latest guidance technologies, including AutoTrac Vision and AutoTrac RowSense, that improve application accuracy and reduce crop damage and operator fatigue. AutoTrac Vision uses a front-mounted camera to help guide the sprayer wheels down the center of the crop rows early in the season; AutoTrac Row Sense relies on wheel-mounted paddle sensors to help steer the machine down row middles later in the growing season. The ExactApply nozzle control system is another popular technology that improves sprayer performance. It allows the sprayer to maintain consistent droplet size and pattern through a wide range of speeds, while reducing the potential for overlaps, skips and drift. Another major benefit of ExactApply is that operators have full turn compensation and shut-off functionality at the nozzle level (every 15-20 inches (38.1-50.8 cm)), which can help reduce input costs by 2 to 5 percent. The new R4044 Sprayer can be ordered starting in June with delivery expected to start by the end of 2018. 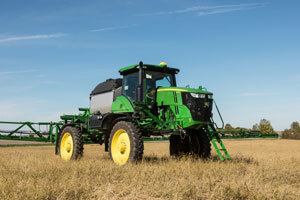 For more information on the new R4044 Sprayer and the full line of John Deere self-propelled machines, contact your local John Deere dealer or visit JohnDeere.com/ag.